They don't have backup power? The fact is, chemtrails, the government program of doping the air with weather modification chemicals from high flying jets, producing long, non dissipating vapor lanes in the sky that stretch from horizon to horizon and can last for an hour or more, have had major effects on the atmosphere. They began in the early 1950's and, back then, they were invisible, but, even then, they had significant results. They6 caused the number of tornadoes per year to cease being a nearly constant 180 and, instead, skyrocket to seven or eight times that number now. They caused the first and only December hurricane on record, Alice, in 1955, and they brought about the first new cloud species since the founding of the Cloud Atlas, the cirrus intortus. In 1997, the air apparently became saturated with chemtrail chemical, and, so, any new contribution simply precipitated out, and that's when chemtrails became visible. Most who warn about chemtrails think that's when they began, because that's when they first saw them in huge numbers, up to a dozen or more in one part of the sky, but that's actually when the air became saturated with chemtrail chemical. That's also when the staccato drumbeat of manifestations indicative of climate change began! The warmest years on record; the largest year-to-year Arctic sea ice drop on record; the accelerated melting of glaciers; unprecedented hundred degree heat waves from London to Siberia; the worst hurricane season on record; tornadoes occurring where they used to be unknown, like Brooklyn; the Northwest Passage being open for the first time in recorded history; the worst “el Nino” events in history; the disappearance of bees; the arrival of previously unknown hundred mile per hour straight line wind storms called “super derechos”; the development of the first new cloud species since cirrus intortus, undulatus asperatus. Another major effect has been the air apparently beginning to lose the ability to support aircraft. There doesn't seem a time now when there aren't patches of this denatured atmosphere somewhere around the world. Airlines do their best to avoid flying into them or to fly around them. “Accidents”, “incidents” and “malfunctions”, on the ground or in the air, are at record levels. “Cancellations” and “delays” occur with unprecedented frequency. Never before did a pilot refuse to take off because two men on board were dressed in “imam garb”. Never before did a pilot refuse to take off because a young man aboard had on low cut jeans that exposed his underwear. Never before did a pilot decide a plane could fly despite a mechanical compass device being broken, then, just before taking off, suddenly decide to return to the gate to have it repaired. Never before did a flight overshoot its destination because the pilots aboard were “distracted”. In just one week, last year, there were two separate cases where flights were “diverted” because of “disruptions” due to a device that is supposed to increase leg room. Just last year, there was the case of the “delay” because a South Korea Airlines executive flew into a rage because she was served nuts in a bag rather than on a plate. Earlier this year, there was a “diversion” because a passenger became “unruly” because he couldn't practice martial arts on board plane. There was also a “delay” when a woman opened the exit door during takeoff, “thinking it was the lavatory door”, despite having a window in the door that allowed you to see outside the plane. A diversion of a flight only a couple of weeks ago because of a passenger supposedly laying out “wired devices” on the floor of the plane. A jet supposedly landed at a military airport instead of a commercial airport because “the runways were in the same direction”. 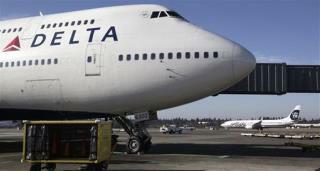 A plane was delayed in taking off because the door had been left open. Among other things now, pilots report being instructed to fly faster. It looks as though the airlines want to make sure their planes are in the air for shorter and shorter times, evidently to avoiding forming regions of denatured atmosphere. Only a few days ago, a man and woman were removed from a flight “because they were speaking Arabic”, which likely caused a delay in the flight taking off. Now this. Just saw an update: They're saying it was caused by a power outage in Atlanta at 2amET. As of 8:40amET, they are resuming some flights. I like the advice given by Gizmodo, though: "If you’re on a Delta Airlines flight that has been grounded, our advice to you would be to get the hell out of the airport and extend your vacation by a day or two."